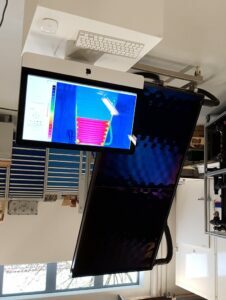 Demonstration-collector at 80 °C (without glass cover): The upper half is equipped with a thermochromic absorber and the lower is equipped with a standard absorber. Transmittance and reflectance of TCO coated glass with and without anti-reflection coatings. The workgroup “Solar Thermal Materials” is working on the development of selective absorber coatings, coatings for heat protection glazing, anti-reflection coatings, and on switchable elements. 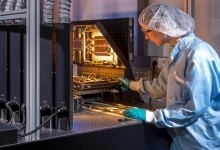 Using the practical experience from CalTeC and the materials and technological know-how, which we have acquired in the field of thin-film technology for solar cells, we are developing point-focal alternatives for thermal collectors and glazings in order to either give coatings special properties or to establish inexpensive processes for industry. We support the industry with material-scientific and optical analyses as well as with standard load tests during the development in the laboratory, the upscaling, and the implementation in production. High solar yields are already reached with the absorbers of current solar heat collectors. In the case of missing heat requirement in the summer, however, they also lead to high temperature loads of all components in the solar fluid circle. 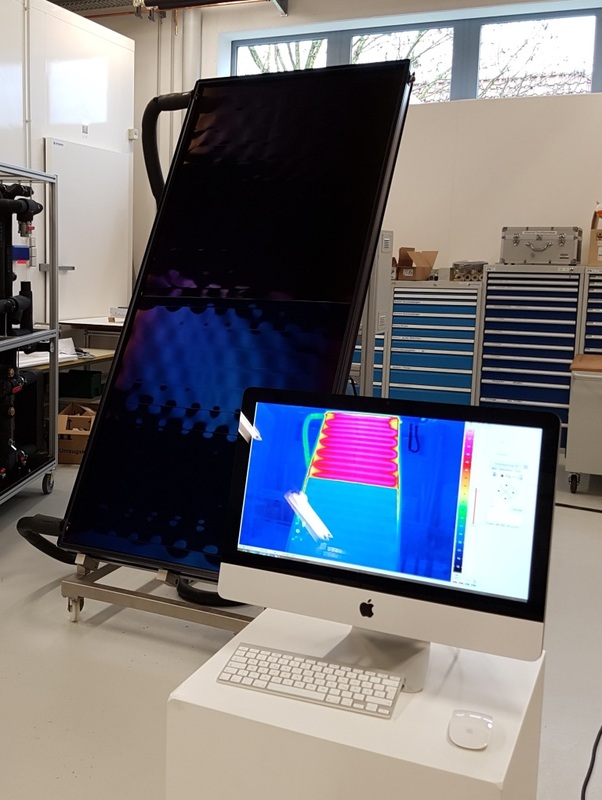 To overcome this overheating problem we developed a thermochromic absorber and are optimizing it further, which switches by a physical phase change automatically to „radiate heat to the environment “, as soon as collector and storage tank reach the maximum operating temperature. This prevents an overheating of the solar fluid circle, which prevents associated steam formation and the long-term decomposition of the frost protection agent. We examine system integrated thermochromic collectors on our test roofs in detail. The base for heat protection glass are silver layers that are only a few nanometers thick. If, apart from thermal insulation and reduction of the thermal emissivity, high transparency in the visible and solar spectral region are also desired, transparent electrically conductive oxides (so-called TCO´s) can be used. 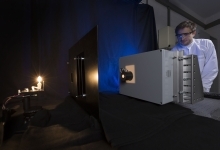 We develop functional, optical layer systems with integrated corrosion protection and anti-reflection coatings as well as with diffusion barriers for specific spectral regions. An example is the low-e coating for highly-efficient, double glazed solar heat collectors, which withstands also the process of the glass toughening. 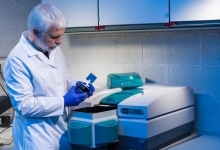 Optical characterization is essential for the development of functional layers. For solar and thermotechnical questions this also always includes the mid-infrared range. A focus point of our group is the investigation of complex layer systems by means of spectral ellipsometry in the spectral region of 240 nm to 33,000 nm. This way we can, for example, measure the temperature dependent optical switching of thermochromic layers in-situ and simulate the spectral reflection index and extinction coefficient.